The Arduino Yún rev. 2 is an Arduino board unlike any other. 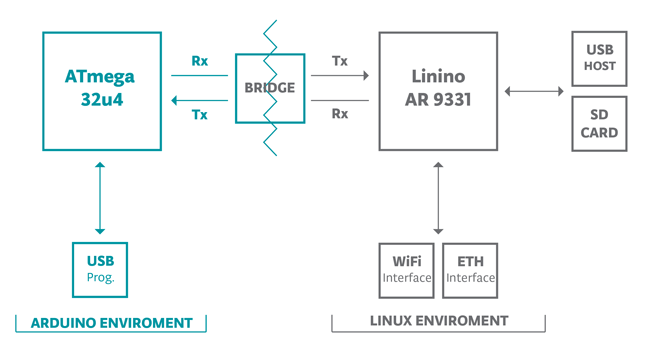 While programming it is very similar to the Arduino Leonardo and uses the same processor, the Atmel ATmega32U4, it also has an additional processor, an Atheros AR9331, running Linux and the OpenWrt wireless stack. Programming the 32U4 via USB is identical to the Arduino Leonardo. Once you've configured the Yún rev. 2 to connect to your WiFi network, you can program the 32U4 via WiFi as well. The Arduino Yún rev. 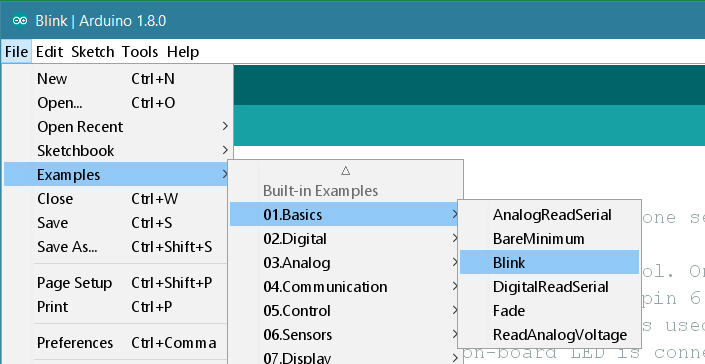 2 is programmed using the Arduino Software (IDE), our Integrated Development Environment common to all our boards. 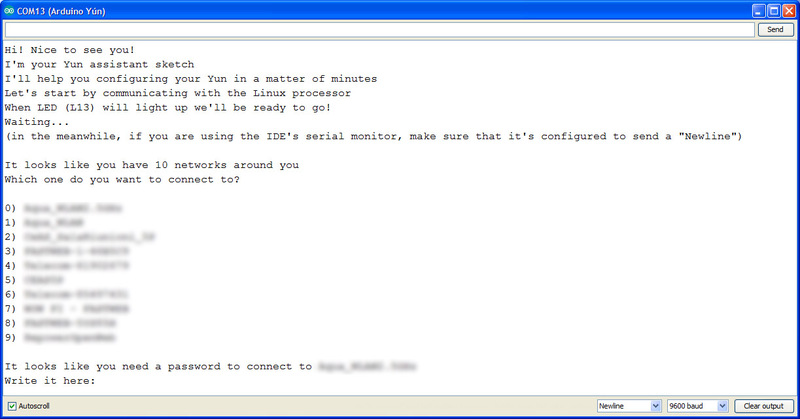 You should have already it installed on your PC, as explained in the home page of our Getting Started. There's nothing to configure with the Yún Rev. 2. A few seconds after the upload finishes, you should see the on-board LED start to blink. If it does, congratulations! You've gotten your Arduino Yún rev. 2 up-and-running. If you have problems, please see the troubleshooting suggestions. Now that you have set up and programmed your Yún rev. 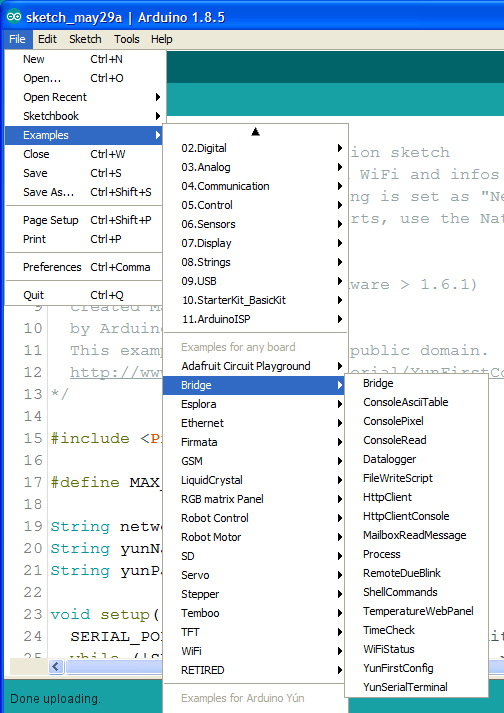 2 board, you may find inspiration in our Project Hub tutorial platform, or you can dig in deeper with the Bridge library and examples. You can also check out the Yún rev. 2 hardware page for additional technical information. In addition to the 32U4 chip, the Yún rev. 2 has an additional processor, an Atheros AR9331, which runs a distribution of Linux for embedded systems named OpenWrt-Yun, based on OpenWrt. A full install of Python 2.7 is included as well. The Yún rev. 2 has a number of different physical characteristics and connectors than the Leonardo. 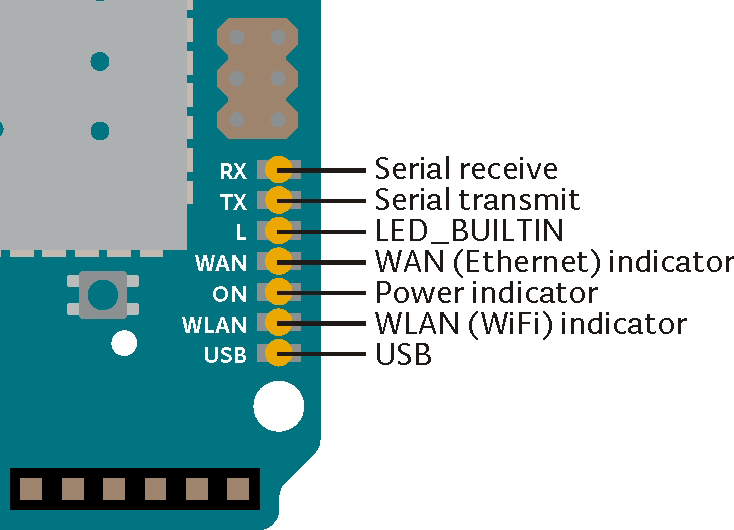 There is an on-board SD slot, Ethernet jack, and a USB-A Host connector. There is no power barrel connector on the Yún; it can be powered from the micro-USB connector. There is no built in 5V regulator. If you power your Yún rev. 2 with more than 5V, you will likely damage it. If you are not powering the Yún rev. 2 from the micro-USB connection, you can apply power to the VIN and 5V pins on the board. If using the VIN pin, you cannot provide more than 5V, it will damage your board. It is recommended to power the Yún rev. 2 from the USB connection whenever possible. The Yún rev. 2 also has a WiFi module built on board, allowing it to connect to a wireless router, or act as an access point. The Yún rev. 2 runs a distribution of Linux called OpenWrt-Yun, based on OpenWrt. While it's possible to configure the system from the command line, there is a web page that allows you to configure many of the different options available. 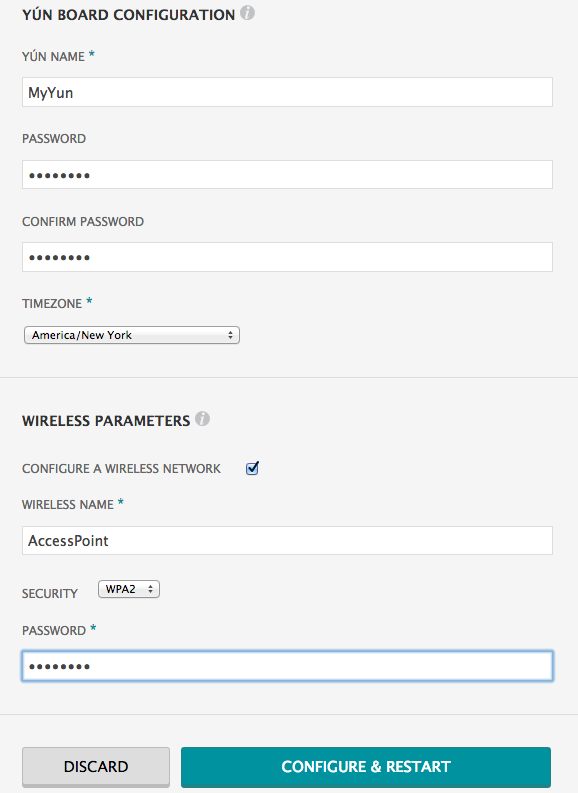 The interface (called LuCi) gives you access to most any setting you would need for maintaining the WiFi interface. To install additional software on OpenWrt-Yun, you need to use the the Linux package manager opkg. For more information on the manager and some common commands, see the Yún rev. 2 package manager page. 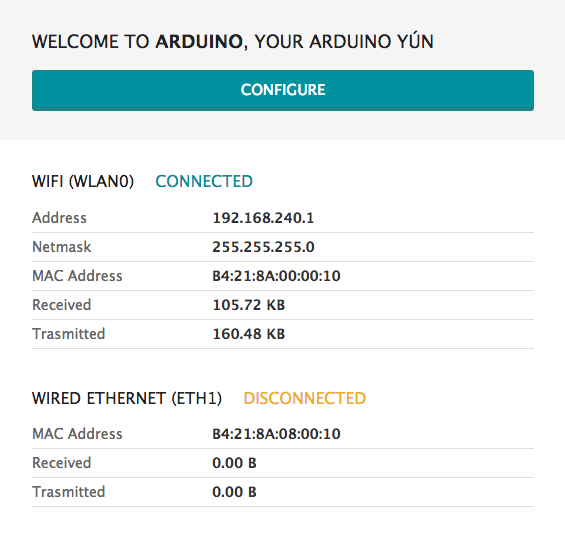 Due to continuous improvements and suggestions coming from both the OpenWrt community and the Arduino community, version of OpenWrt-Yun installed on your Yún rev. 2 may be out of date. Please check the upgrade tutorial and be sure you're running the latest version available. You can use external memory like a microSD card or thumb drive for saving data, or your own scripts, web pages, etc. For the Yún rev. 2 to access and store information on these drives through the 32U4, they need to have a directory named arduino in the root of the volume. If you plan to use a microSD memory card, you can expand the Yun Disk Space following this tutorial. By default, the REST API access is password protected. It is possible to change this to access the services without a password. To change this setting, enter the Yún rev. 2 configuration panel. At the bottom of the page, you will see toggles for changing the access. To restart the AR9331, which reboots OpenWrt-Yun, press the "YÚN REV. 2 RST" reset button that is close to the analog inputs pins and the LEDs of the board. If you move to a different network and can no longer wirelessly access the Yún rev. 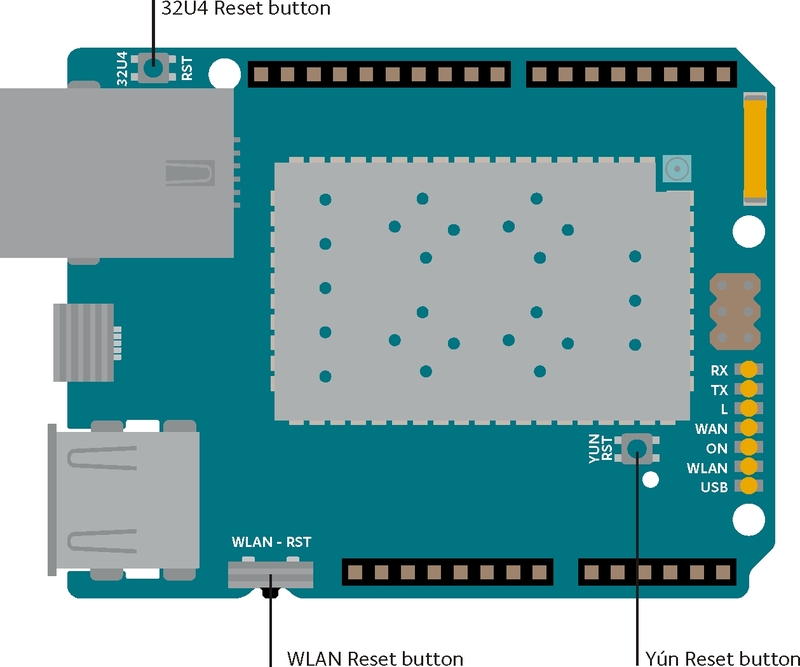 2 through its web interface, you can reset the Yún's network configuration by pressing the WiFi reset button (WLAN RST) for longer longer than 5 seconds, but less than 30, the AR9331 processor will reboot. The WiFi configuration will be reset and the Yún rev. 2 will start its own wiFi network Arduino Yún-XXXXXXXXXXXX. Any other modification/configuration will be retained. Since the Yún rev. 2 does not have a dedicated chip to handle serial communication, it means that the serial port is virtual -- it's a software routine, both on your operating system, and on the board itself. Just as your computer creates an instance of the serial port driver when you plug in any Arduino, the 32u4 creates a serial instance whenever it runs its bootloader. The board is an instance of USB's Connected Device Class (CDC) driver. This means that every time you reset the 32U4 processor, the USB serial connection will be broken and re-established. The board will disappear from the list of serial ports, and the list will re-enumerate. Any program that has an open serial connection to the Yún rev. 2 will lose its connection. 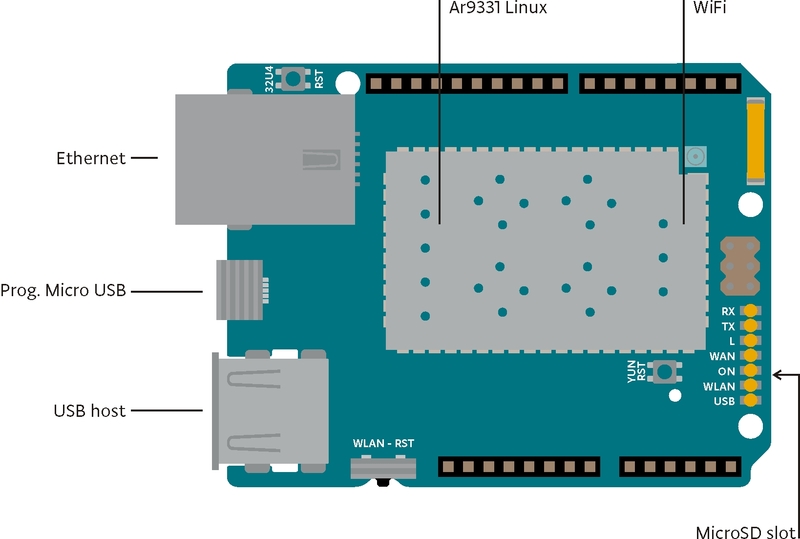 This is in contrast to the Arduino Uno, with which you can reset the main processor (the ATmega328P) without closing the USB connection (which is maintained by the secondary ATmega8U2 or ATmega16U2 processor). This difference has implications for driver installation, uploading, and communication. The Yún rev. 2 won't restart your sketch when you open a serial port on the computer. That means you won't see serial data that's already been sent to the computer by the board, including, for example, most data sent in setup(). To simplify the configuration of the Yún rev. 2 board we have prepared a sketch that will allow to input all the relevant information through the Arduino Software (IDE) Serial Monitor. This is an easy and quick solution that also is ideal for multiple boards set ups like workshops and classrooms. 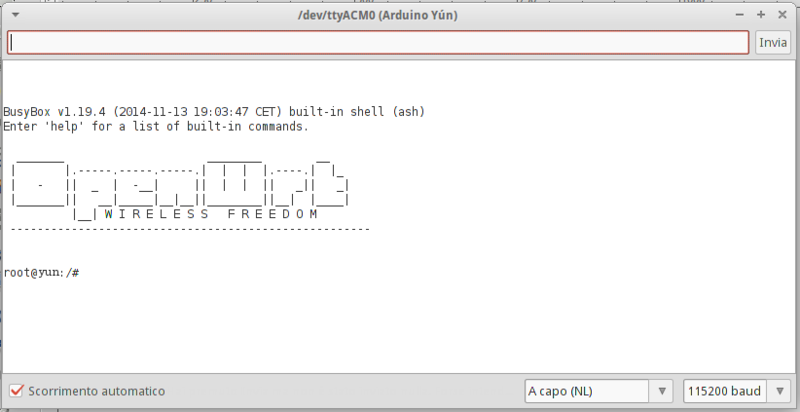 The sketch is available already in your Arduino Software (IDE) installation under Examples > Bridge > YunFirstConfig. 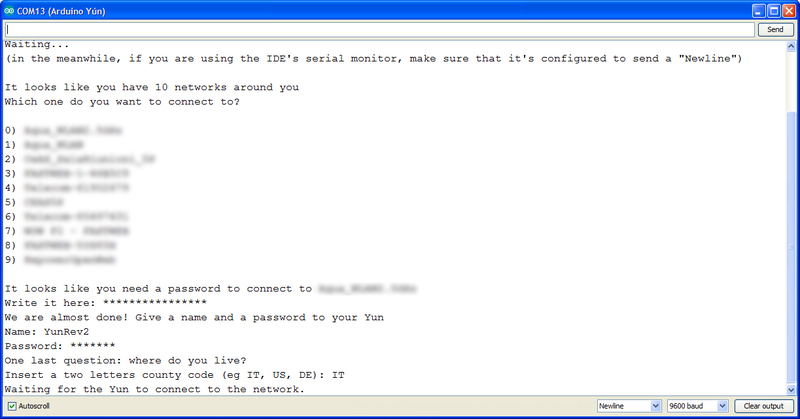 As soon as the sketch is uploaded, open your Serial Monitor window and follow the instructions. The Yún rev. 2 has the ability to act as an Access Point, but it can also connect to an existing network. These instructions walk you through connecting your Yún rev. 2 to a wireless network. The Yún rev. 2 can connect to unencrypted networks, as well as networks that support WEP, WPA, and WPA2 encryption. In the Yún rev. 2 NAME field, give your Arduino a unique name. You'll use this to refer to it in the future. When your Yún rev. 2 is on the same network as your computer, you can connect to it wirelessly to program it. 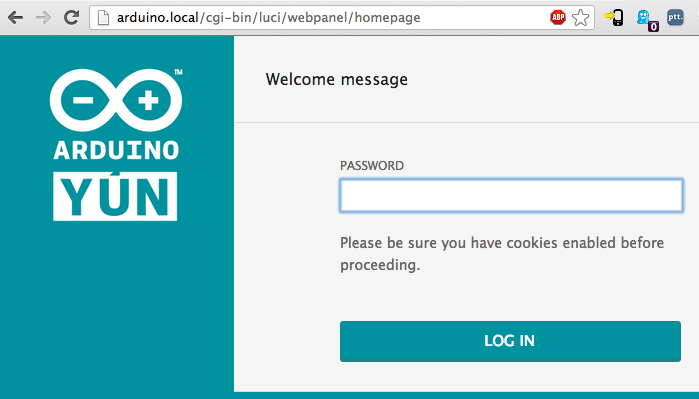 The Console, based on Bridge, enables you to send information from the Yún rev. 2 to a computer just as you would with the serial monitor, but wirelessly. It creates a secure connection between the Yún rev. 2 and your computer via SSH. 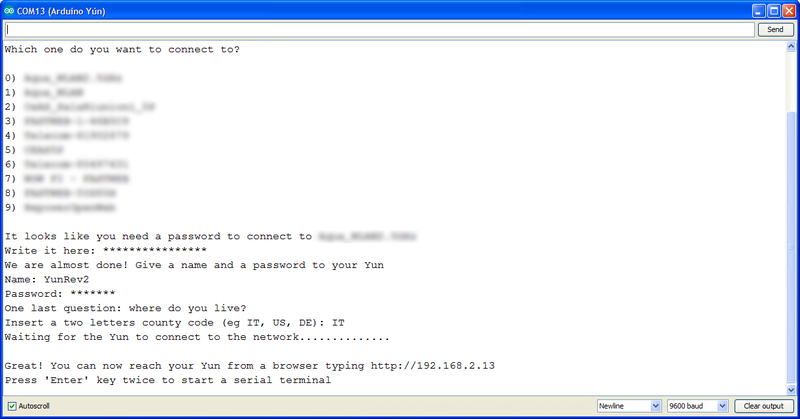 To see the Console, select your Yún's name and IP address in the Port menu. The Yún rev. 2 will only show up in the Ports menu if your computer is on the same LAN as the Yún. If your board is on a different network, you won't see it in the Ports menu. Open the Port Monitor. You'll be prompted for the Yún's password. The Yún rev. 2 comes with several pieces of software pre-installed on OpenWrt-Yun, including "curl" and "python". You may want to install other software on the Yún. On Linux systems, additional software can be installed using a tool called the "package management system". For more information, refer to the package manager tutorial.